"I got this simple recipe 20 years ago from my friend J.J. The secrets to this classic comfort-food are American cheese and creamed corn. I have tried every cheese on earth over the years, and American seems to work the best. Prepare the mashed potatoes to your liking--I season mine with milk, butter, and pepper. My kids and I go crazy for this!" Heat a large skillet over medium-high heat. Cook and stir beef in hot skillet until browned and crumbly, 5 to 7 minutes; drain and discard grease. Stir cream-style corn and corn niblets together in a saucepan over medium heat; cook and stir until heated through, 5 to 10 minutes. Spread ground beef out in the bottom of a casserole dish. Top with 8 slices American cheese, corn mixture, remaining cheese slices, and mashed potatoes, respectively. 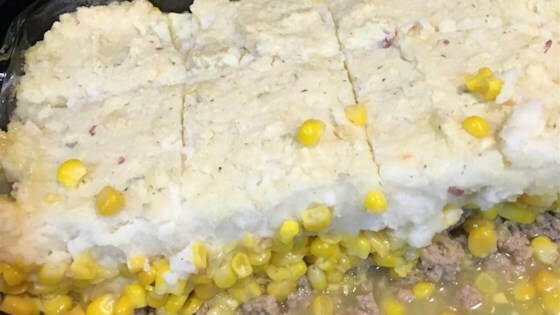 Bake in the preheated oven until corn mixture bubbles along the edges of the dish, about 30 minutes. Cool briefly before slicing. made it exactly like the recipe, used my famous Garlic Mashed Potatoes. I let it sit for about 30 mins. Its a Keeper for sure! I like to use ground sausage instead of ground beef, and I don't put cheese in mine.